An eminent Cabernet wine which can lay claim to coveted accolades such as Blue Gold Sydney International and Gold Concours Mondial de Bruxelles. 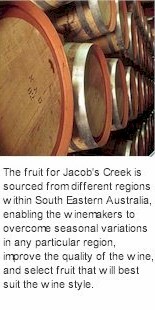 Jacobs Creek retain South Australia's finest vineyards and aim to improve the quality of wine every year. Vinified to the most exacting standards, the team make regular trips to the vineyard assessing development of fruit. An enduring Australian Cabernet, displaying intense cassis characters, subtle tannins and rich French oak, right through to the smooth, lingering finish. Grapes are de-stemmed and crushed to small static fermenters, inoculated with neutral yeast and vinified for a fortnight. The sensory characteristics are checked twice daily, pumpover regimes are attenuated to maximise the extraction of flavour, colour and tannin. Ferments are pressed off skins and free run, followed by a return to add palate weight and structure. Malolactic is carried out in new and prior use French and American oak hogsheads, followed by an extended maturation. The barrels are sampled and trialled, ensuring that only those parcels displaying intensity of fruit, balanced tannins and soft oak, are worthy of being included into the finished Jacobs Creek Reserve. Deep crimson red. Concentrated, lifted cassis and black fruits of the forest nose, subtle notes of mint, chocolate and attractive toasted oak. This vigorously fruit driven and powerfully structured wine is filled with vibrant, varietal black currant flavours, mint and cassis, dried herb and capsicum over tight tannins, framed by smoothly integrated oak, well balanced before a long persistent finish.